You can easily decline the basket of bread when these sumptuous little shrooms arrive sliced, sautéed in white wine and garlic, and brightened with a touch of lemon. Prepare your palette for the entrée meats with a delicious meaty appetizer. This classic Argentinian sausage features a savory blend of beef, pork, and South American spices. Nearly every salad on the menu is low-carb friendly, but the Quinquela salad is refreshingly hearty. Starting with mixed greens, tomatoes, hearts of palm, carrots, and onions, we add creamy avocado and protein-rich hard boiled eggs—so filling it could be a meal on its own. Fish is not only both Keto and Paleo-friendly, but it’s also full of rich omega-3 fatty acids that are known to promote brain function. This salmon dish is grilled then sautéed in olive oil, garlic, parsley and white wine, and served with seasonal vegetables. Grilled chicken breast is a tried-and-true staple of almost any diet, and we jazz it up with two options: “Al Champignon,” with mushrooms and white wine sauce, or Al la Provenzal, with olive oil, butter, garlic, parsley and white wine sauce. Argentina is known for its delectable steaks, so of course this legendary 12-ounce sirloin center cut is grilled to perfection. 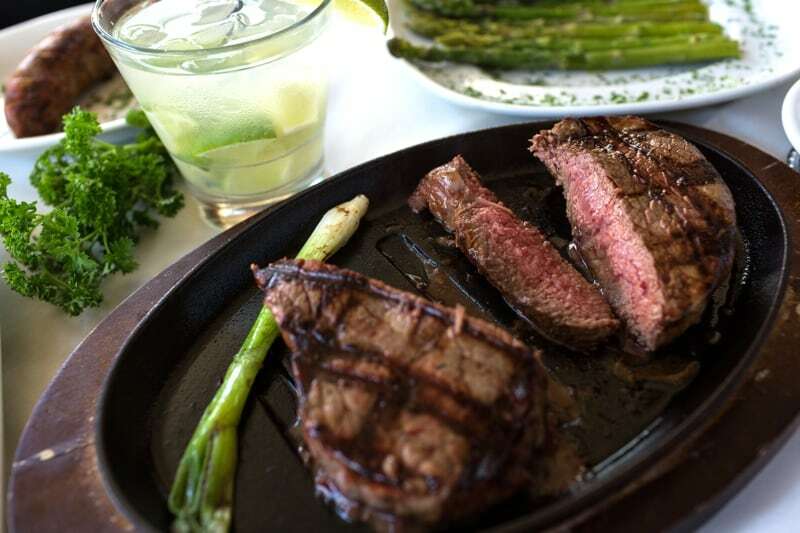 Most of our steaks are served with a choice of fries, mashed potatoes, or rice, but you can substitute with steamed vegetables to keep it low-carb. The Keto diet includes dairy within its guidelines, so splurge with 12 ounces of Northern Argentina’s favorite culotte cut, which we grill, slice, and smother with a Roquefort cream cheese sauce and three tiger shrimp. Looking to plan a romantic dinner at a low-carb restaurant for your fellow meat-loving significant other? You can’t go wrong with our Parrillada “el Conventillo,” a sizzling made-for-two platter featuring short rib, skirt steak, culotte-cut steak, chicken breast, chorizo sausage, blood sausage and sweetbreads (note: sweetbreads do not contain bread). If you’re having trouble finding a Keto restaurant or Paleo restaurant in the San Diego area, look no further than Puerto La Boca in Little Italy. Much of our authentic Argentinian cuisine is naturally low-carb, and you can always substitute carb-heavy sides for vegetables. Come dine with us today!